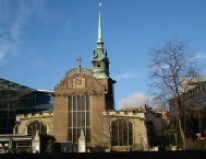 All Hallows by the Tower is the oldest church in the City of London and a living church serving today’s City community. As well as being the custodians of a wonderful historic building, we strive to be an Inclusive Church and our mission is to offer a Christian welcome, sanctuary and inspiration on Tower Hill, continuing a tradition dating back to the 7th century. Despite being largely rebuilt after the Second World War, All Hallows retains many original features from its long history, including a Saxon arch and a tessellated Roman floor. The church and its crypt museum contain many important items, such as a carved font cover by Grinling Gibbons, a Flemish triptych dating from around 1500 and a fine collection of mediaeval brasses. All Hallows by the Tower is located next to the Tower of London, on the eastern edge of the City of London. We are close to Tower Bridge, The Monument, Leadenhall Market and the lovely gardens of St Dunstan in the East, and within easy reach of St Paul's Cathedral.